An Achilles tendon rupture is a painful injury that can sideline you for a long time. Even worse, it might never fully heal in the correct way if you don’t get the right treatment. Fortunately, you can start finding the treatment you need at our Bloomington office. The injury itself takes place when an Achilles tendon sustains a sudden increase in stress. This can happen during intense sports participation, but also following a fall from height or by unexpectedly stepping into a hole in the ground. A torn Achilles tendon can be a big problem on account of its functionality and purpose. Your Achilles connects your calf muscle to your heel bone. In doing so, it enables you to raise your heel off the ground (which is obviously important for stepping and jumping). To handle the tremendous forces needed to propel the body forward in an explosive manner, this particular tendon is the strongest. Of course, it’s not infallible and tends to be the most commonly injured tendon in the human body. At the time of the injury, you may feel a pop or snap, and then a sharp pain in the back of your ankle and lower leg. In all likelihood, this will affect your ability to walk and rise up onto your toes. Additionally, you will experience a swelling in the back of your leg, between the calf and your heel. Depending on the nature of your case, proper treatment for your Achilles tendon rupture will be either conservative or surgical. In cases where nonsurgical treatment is the recommended course of action, we may prescribe rest, ice, pain relievers, and immobilization. In the case of surgical treatment for an Achilles tendon rupture, the goal is to reattach the torn ends of the connective tissue. This can be an important step for ensuring the damaged tissue heals correctly and reducing the risk of chronic pain. After your surgery, you’ll wear a cast or special boot for a while, and we will monitor your progress. Once your foot is safe to move, you’ll begin physical therapy to help your Achilles regain function and increase its range of motion. 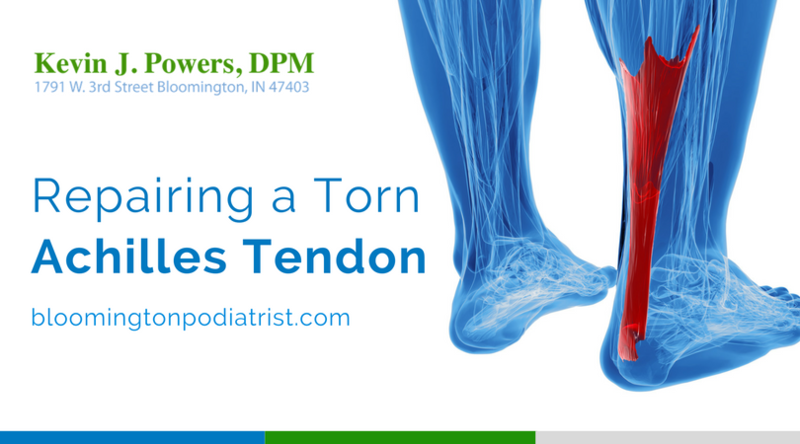 After your tendon is completely healed, you’ll be able to ease back into normal activities and routines. Achilles tendon ruptures can be prevented by stretching and strengthening calf muscles, mixing up your exercises, and gradually increasing training intensity. With this in mind, be sure to stretch properly before games or practices. Also, ease into athletic completion with a progressive workout routine instead of jumping right into intense competition. For more information on Achilles tendon repair—or any of the foot and ankle services we provide—contact our office by calling (812) 333-4422. If you’d prefer, please feel free to take a moment right now and connect with us via our online form found here on our website.